Clarksdale, known as the birthplace of blues music, once boasted one of the largest Jewish communities in Mississippi. A town created at the junction of two American Indian travel routes, Clarksdale was a home to Jews from the 19th century until the present day. The first Jews came to this center of Coahoma County after immigrating from Germany in the late 1870s. The Jewish community grew to four hundred people by the end of the 1930s and continued to be strong until the 1970s. By 1896, enough Jews lived in the area that a minyan could form in private homes. This group eventually grew and built a synagogue by 1910, which they named Kehilath Jacob. The community later renamed the institution Congregation Beth Israel. With a larger community, other organizations followed, including B’nai Brith in 1910 and the Ladies’ Aid Society in 1916. Sunday school began in 1916 with fifty students and four teachers. By the 1930s, the synagogue had reached pinnacle growth. The congregation dedicated a new synagogue in 1929, and new chapters of a temple sisterhood and Hadassah formed, as well as a temple youth group. Around the late 1930s, the synagogue formed Beth Israel Cemetery, a memorial park north of Clarksdale on what many know today as Friar’s Point Road. This cemetery replaced other burial sites for Jews including one in Tutwiler. Economic factors attracted Jewish settlers to Clarksdale. It was an accessible city on the Delta, first by river and later by railroad. This made the area attractive to passing Jewish merchants looking to set up shop in a growing community after earning capital as peddlers. Though Clarksdale had historically experienced flooding from the Mississippi River, these floods helped to increase the fertility of the surrounding farm land. In Clarksdale, where plantations were popular, cotton was king. In fact, the cotton picking machine found its roots in Coahoma County. Some Jews were deeded farm land from debtors, but most were not cotton farmers. Nevertheless, many involved themselves in agriculture-related or supplementary businesses. For example, Herman Dansker started Rose Seed Company, where he not only supplied local farmers but also helped to increase cotton productivity with his innovation of skip-row planting, a process of planting more cotton on outside rows. 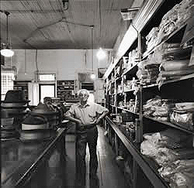 Max Kaufman, a longtime leader and founder of Congregation Beth Israel, owned Mark’s Tailor Shop, a store popular with the properly-dressed gentleman. 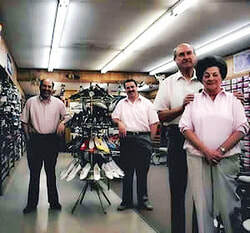 Other stores in Clarksdale included Okun’s Shoe Store, and the Style Shoppe, a popular ladies’ clothing store founded by Kate and Maurice Sebulsky that lasted in Clarksdale until the early 1990s. Ruben and Esther Dinner ran a restaurant, called "The Sanitary Cafe," that served gefilte fish under the name "Good Luck Fish Balls." The restaurant's motto was "eat dinner with the Dinners." Around the 1920s, dry goods stores, department stores, haberdasheries, jewelry stores, grocery stores, and tailor shops all opened in Clarksdale. Families worked together as a group in the quest for success in this new community; Clarksdale society even tolerated “foreign” women working outside the home in the store, which was not socially acceptable for native-born white women. Not only did many of these merchants cater to the whites that resided in the town, but many Jews also sold to African American customers. Throughout most of the twentieth century, the business district of Clarksdale underwent many changes, yet patrons could always find Jewish merchants along the busy streets. 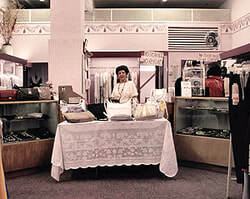 Although some stores went bankrupt, which caused some to reopen under “new” ownership, Issaquena Avenue, Delta Avenue, Third Street, Yazoo Avenue, and Sunflower Avenue were always home to friendly Jewish shops. Jews frequently lived near their businesses, either in Jewish neighborhoods or in mixed areas with African Americans. While a majority of the Clarksdale Jewish community lived in the town itself, some members traveled as far as thirty miles to be part of the greater Jewish community. The Lovitz family, for example, owned a department store in Webb, a place with only a few Jewish families out of a town population of 500. Aaron Kline operated his dry goods store, called The Whale Store, in the small town of Alligator. The success of the Jewish merchant class, along with their economic importance, resulted in a good deal of civic engagement. While B’nai Brith existed for Jews like a Rotary or Civitan Club would for other citizens, many Jewish people sought involvement in the Masonic Order. Many Jews, including 1920s temple president David Abrams and temple founder Max Friedman, held high positions with the group. As contributing businessmen with good monotheistic values, these Jewish people certainly did not feel excluded, and they were treated with the utmost respect. This respect extended to the political arena as well. Whenever elections occurred, many politicians campaigned for the Jewish vote. Many residents also acknowledged that the first building of the synagogue could not have come into being without the political influence of founder Louis Goldstein, who received financial support from many non-Jewish local leaders in the temple’s inaugural capital campaign. While the early 1900s represented a rise in the Clarksdale Jewish community, there were still obstacles to be faced. The Great Mississippi Flood of 1927 was a tremendous natural disaster, and Clarksdale, historically prone to flooding, was greatly impacted. Business halted during some of the flood, people had to follow the levees in order to get to synagogue, and Herman Damsker of Rose Seed Company built tall scaffolds to protect his seeds. The flood was soon followed by the Great Depression, during the 1930s, and many businesses, including Jewish ones, closed or had to take out risky loans. Even through hard times, these Jews stayed together as a community and prayed often, which led to more growth in the synagogue. In response to the Holocaust, the larger Clarksdale community supported its Jewish population by donating a monument for Beth Israel Cemetery to commemorate those lost. For many, this was a show of true unity in a heterogeneous community. Aaron Kline operated the Whale Store in the nearby town of Alligator. World War II caused people to move in and out of Coahoma County, but Clarksdale was still home to nearly 300 Jewish people after the war. Throughout the 1950s and 1960s, the Binder family owned businesses specializing in dry goods, feed, and hardware. The family also farmed, even as Clarksdale’s economy became less dependent on cotton as a staple. Even with generational changes, a hundred families still belonged to Congregation Beth Israel in 1970. Unlike the preceding generation of merchants, many of them were doctors, lawyers, and accountants. Examples included Dr. Julius Levy and Dr. Melvin Ehrich. By the 1970s, it was clear to many that Clarksdale was beginning to change. Cotton farming was not as lucrative as it once had been; without it, many of the associated stores did not survive. With better highways and technological advancements, Clarksdale soon became a bedroom community for places like Memphis, a big city with greater opportunities that was only a little over an hour away. As a result, many longtime residents moved to Memphis, though some continued to worship at Congregation Beth Israel. By 2003, less than 20 people remained as members of Congregation Beth Israel. In March of that year, the remaining members decided to hold a final service to commemorate the many ceremonies performed over the synagogue’s century-long existence. This finale drew hundreds of people with many of the younger generations coming back from Memphis. The temple was full again if only for the farewell. The building was eventually sold, with the proceeds going to support perpetual care of the Beth Israel Cemetery.